Back in July, we announced a competition that we were holding with “Do You Remember?” where one lucky winner would end up with their very own extremely limited edition Cool Surface artwork created just for them! 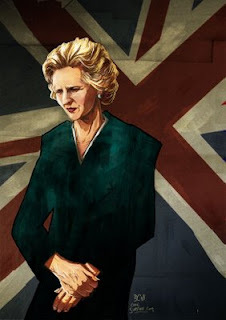 As you can see the winner went with a very definitive (albeit unexpected) icon from the 80’s, UK Prime minister Margaret Thatcher. It was a bit of a different topic from Superted, He-Man or Barbie as we expected, but proved to be interesting subject matter nonetheless. PS. Apologies for not updating the blog last week, we were relocating to our new home. Don’t worry though, we’re settled into the brand new Cool Surface towers and normal service has been resumed! You are currently browsing the archives for the iron lady category.